This ankle brace is one size bigger,please check the size guide carefully before purchase. If the size you bought does not fit you well please contact us first or request for exchange before giving us the negative opinions. Our customer service team will be with you to solve your problem. Thanks for your cooperation, we will be extremely grateful. Application: Plantar Fasciitis, Relieve pain, Discomfort, Sprain, Joint fatigue, Swelling, Achilles tendonitis, rehabilitation after injury. ABSORBENT, BREATHABLE, SKIN-FRIENDLY CORMFORT: Made of high quality fabric Polyamide 65%, Latex 32%, Spandex 3%, minimizes odors through moisture-wick properties and optimal joint temperature regulated through high-Performance. 3D THREE-DIMENSIONAL STRUCTURE OF WOVEN: High-precision 3D cutting technology of knitting, ergonomic, 360-degree body curve perfect fit ankle, wearing more comefortable. Contoured Fit allows for maximum comfort and prevents slippage. 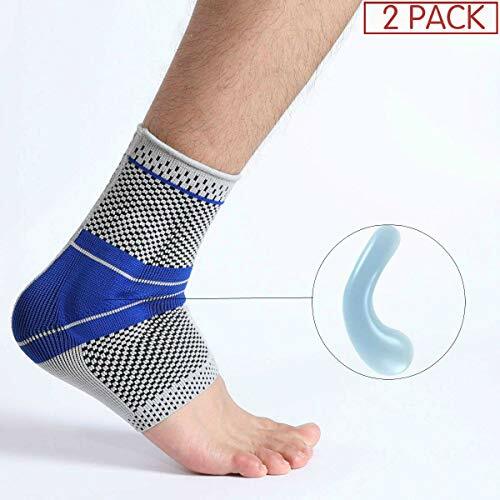 SOFT AND DURABLE SILICONE PADDED: Soft silicone pad sewn into ankle brace to protect the ligament and the malleolus bones. Double silicone anti-slip wave band that provides the best stability, so you won’t have to re-adjust it during your activities. IMPROVES BLOOD CIRCULATION & RELIEVES PAIN: Significant pain relief from a variety of ailments including arthritis, sprains, swelling, tendonitis, muscle fatigue, and other ankle pains and injuries. Also improves blood circulation for fast recovery. INJURY PREVENTION :Minimizes injury, offers optimal joint and muscle support between workouts, physical activities, and daily motions. Designed to increase your performance while ensuring you are a step ahead in injury prevention.